As part of preparing for release of Windsor 3.1 I decided to revisit parts of Windsor’s documentation and try to make it more approachable to some completely new to IoC. This and few following posts are excerpts from that new documentation. As such I would appreciate any feedback, especially around how clearly the concepts in question are explained for someone who had no prior exposure to them. As every technology, Windsor has certain basic concepts that you need to understand in order to be able to properly use it. Fear not – they may have scary and complicated names and abstract definitions but they are quite simple to grasp. First concept that you’ll see over and over in the documentation and in Windsor’s API is service. Actual definition goes somewhat like this: “service is an abstract contract describing some cohesive unit of functionality”. The term service is extremely overloaded and has become even more so in recent years. Services as used in this documentation are a broader term than for example WCF services. They are the same for pretty much every coffee shop on the planet. They are the coffee shop service. Does it start making a bit more sense now? The coffee shop has clearly defined, cohesive functionality it exposes – it makes coffee. The contract is pretty abstract and high level. It doesn’t concern itself with “implementation details”; what sort of coffee-machine and beans does the coffee shop have, how big it is, and what’s the name of the barista, and color of her shirt. You, as a user don’t care about those things, you only care about getting your cappuccino, so all the things that don’t directly impact you getting your coffee do not belong as part of the service. Hopefully you’re getting a better picture of what it’s all about, and what makes a good service. Now back in .NET land we might define a coffee shop as an interface (since interfaces are by definition abstract and have no implementation details you’ll often find that your services will be defined as interfaces). The actual details obviously can vary, but it has all the important aspects. The service defined by our ICoffeeShop is high level. It defines all the aspects required to successfully order a coffee, and yet it doesn’t leak any details on who, how or where prepares the coffee. If coffee is not your thing, you can find examples of good contracts in many areas of your codebase. IController in ASP.NET MVC, which defines all the details required by ASP.NET MVC framework to successfully plug your controller into its processing pipeline, yet gives you all the flexibility you need to implement the controller, whether you’re building a social networking site, or e-commerce application. If that’s all clear and simple now, let’s move to the next important concept (in the next post). As we’re nearing to release the next version of Castle Windsor I’m also thinking about how we could leverage Nuget better. One idea I had was to include elements I (and most people) end up writing in every project using Windsor – a Bootstrapper class which is responsible for setting up the container, a folder for installers, and an installer in it. My hope is, this would give advanced users a jump-start and provide a gentle introduction for people new to Windsor, and push them towards established practices when using Windsor (closer to to the pit of success). This is just an idea, and I would like to hear your feedback. What do you think about it? Do you think it should be included at all in the Castle.Windsor package, or should we create a separate package called something like Castle.Windsor-wc (for “with code”) for this? After successful beta and RC releases final version of Castle Windsor (as well as Castle Core, and a whole set of facilities) has now been released. There are no major changes between final version and RC. The difference is some minor bug fixes, improved exception messages and some small improvements all over the place. The packages are available now, on Nuget (with symbols), and via standard .zip download. Last but not least – thank you to everyone who downloaded beta and release candidate and provided feedback. You guys rock. 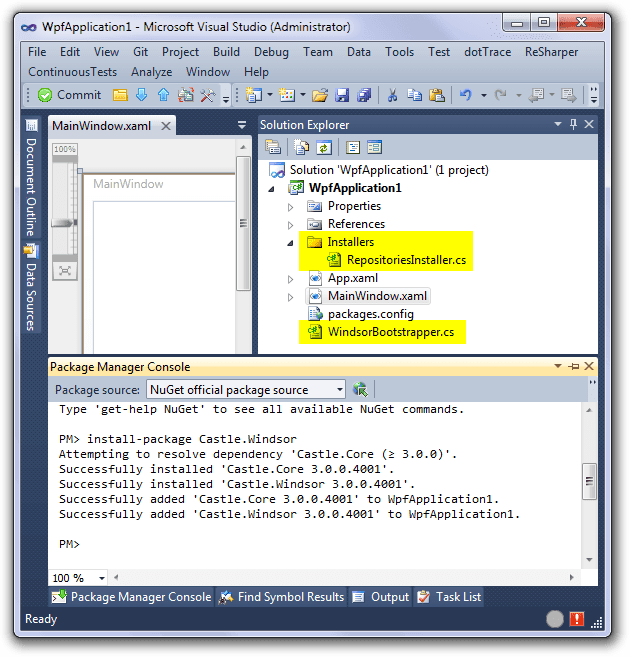 As promised, I released Nuget packages for beta 1 of Windsor 3. This is my first major rollout of Nuget packages, so please report any issues working with them. 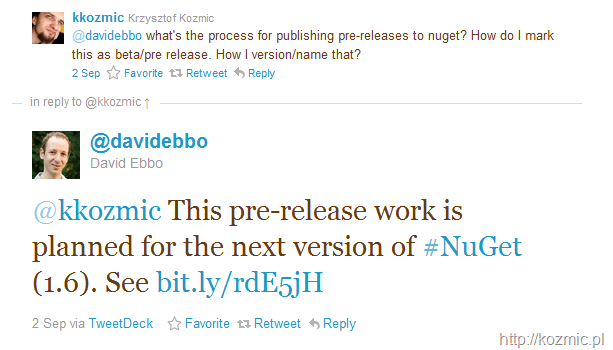 Nuget is quickly evolving and getting more useful with each release. However one feature it’s missing right now is support for pre-release packages (this is coming in the next version). This is not really a big deal, however it means there are a few things you should be aware of. Since the new package is a pre-release, while I would really like for everyone to start using it immediately and report all issues they find, I quite understand that many people will rather prefer to stick to the last official version for the time being. 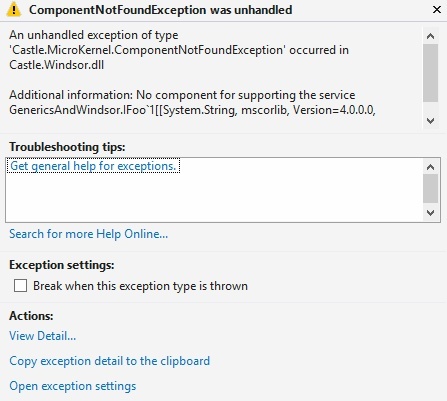 To accommodate that the new packages are not made recommended versions, so your Nuget explorer will still point to the last stable (2.5.3) version if you search for Windsor, Castle.Core or any other pre-existing package. If you go to command line and install one of the packages without specifying version number, it will install the latest, that is beta 1 version. Folks at SymbolSource.org added recently support for Nuget (and OpenWrap as well) and the new Castle packages take advantage of that. What it gives you, is you can now easily debug into Windsor’s code, just like .NET framework reference source (there’s a simple guide at SymbolSource on how to do it). After you’re all set you can step into any of Castle methods in your debugger and watch the magic happen. Very cool thing, even if I say so myself. Castle.Core – Contains Castle.Core.dll which includes DynamicProxy, DictionaryAdapter, EmailSender, logging abstractions and some other goodies. Castle.Windsor – Contains Castle.Windsor.dll which has Windsor itself and two most commonly used facilities – Typed Factory facility and Startable facility. Castle.LoggingFacility – Contains logging facility. Castle.Windsor-log4net – Empty package that just installs logging facility and Castle.Core-log4net (and their dependencies obviously). Castle.Windsor-NLog – Empty package that just installs logging facility and Castle.CoreNLog (and their dependencies obviously). Castle.WcfIntegrationFacility – Windsor’s WCF facility. Castle.SynchronizeFacility – Windsor’s Synchronize facility. I hope this will make it easier for everyone to test drive Windsor. And if you find any issues, have any suggestions or ideas, do not hesitate to bring them up, either on our google group, or issue tracker.